I have brought up before what you see above, and I am very fortunate to be able to bring it up again. It is the cover of Skagos's Ást 2xLP, which is now available from various locations which I've mentioned before, as well as newly available from the band. You can buy either or both editions at the Skagos Bigcartel page, or you can buy it from the Skagos Bandcamp page (in which case you will receive a free download of the album with your purchase).. It should be noted that a purchase of this record directly from the band helps fund the future release of the forthcoming album An-Archic, which I can assure you you'll want to be released sooner than later. (It should also be mentioned that shipping from Canada to Europe is insanely expensive, and that any European friends would be better served to buy this from one of the American labels (Pesanta or Eternal Warfare) that have cooperated to bring this release's physical manifestation to fruition. In any case, I bring this up as it relates to the main thrust of this post - a conversation that I was recently able to have with Ray Hawes about Skagos. The published version of this conversation is long, but I strongly encourage you to read it in its entirety. My deepest appreciation to Ray for speaking with me so openly, honestly, and genuinely about Skagos. Alas, I would guess that he know no other way. HSS: First, let me offer you thanks for the opportunity to conduct this interview. Skagos has not typically done a whole lot of press, so I value this greatly. How have you been? Ray Hawes: And thanks to you for the opportunity to give the entity of Skagos another voice to be heard. It is true that we have shied away from press for the last few years, and I am appreciative for Hammer Smashed Sound to be the medium in which we once again speak out to the world. Your commitment to seeking and sharing meaningful music, as well as your stance with having both feet firmly rooted in the underground has been noted and appreciated by many. There hasn’t seemed to be very much going on with Skagos, in terms of releases, news and updates of any sort, but I have a feeling that much has been going on “behind the scenes.” What can you say to catch up fans of the band on the upcoming reissue of Ast on a glorious 2xLP? Also, has there been any progress towards the release of An-Archic? I’ve been lending much more energy of late to giving more frequent updates to the world at large about our unseen workings, with the hope that those out there that resonate with what we do are not feeling forgotten, or unrecognized. What I can say about the Ast DLP is that I am very excited for this record to receive the presentation that it was always intended to have. At the time of this publication, the album should be readily available. I have heard the test-presses and I can say that the energy and passion that we put in to this record have, at long last, been resolved. It is bewildering for me to think that we wrote and recorded this album in Autumn, four-years-passed. It has certainly been a long, long wait for this to come to fruition. There has been progress towards the release on Anarchic. All movements of music have been completely recorded, polished and mixed for separate formats; the artwork is nearing completion for all different presentation and plans are being solidified for the logistics of the release. The only hindrance at this point is the monetary means to fund the physical manifestation. We’re steadfast in our decision to take the reins of the project and manage our own releases henceforth, but the commitment comes with some major complications regarding funding. The plan as it stands is to release Anarchic with any and all money that comes our way. I imagine that once we receive our copies of the Ást DLPs, the release will not be far off. Ray, you’ve been involved in various other projects in the past couple of years, such as Iskra and Fauna, and I know that Isaac has his solo project “Rain Spirit” as well. Do you both consider Skagos your “main” musical project, or are the others equally as important? Are you still a member of Fauna? I’m not sure that I can categorize Skagos as anything other than what it is. Isaac and I are both individuals prone to leaning on the wind is it comes by, and thusly, we find ourselves involved in many projects, initiatives and activities over a rather vast plain of creative energy. Skagos is a project that is very deeply connected to both of our souls; alas, it is a manifestation of our souls themselves heralding any ears with the capacity to listen; our souls are furthermore a manifestation of the seen and unseen universe at large, whispering and wailing in any language, by any means, utterly unfiltered to whatever harkening audience that lingers long enough to take notice. Thusly, Skagos is simply a piece of our lives at large, but a piece that we choose to share; a piece of the universe at large, which with our voices we share. It can therefore not be classified as a “main project”, but rather a strong force of a larger presence. Or, to answer your question in much fewer words: Yes, while we do consider our other projects to be equally important, Skagos holds a soul-deep commitment within us. We can currently foresee no end to this project, trusting that our hearts still beat. As for whether I am still participating in Fauna or not, the question does not grant a simple yes-or-no answer. 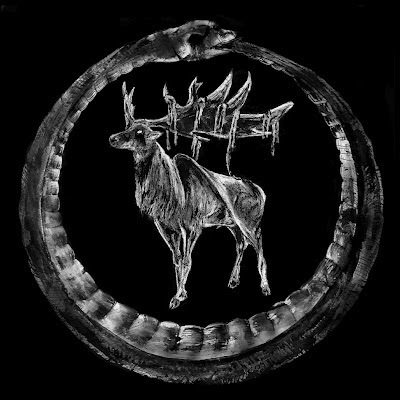 My involvement with the magic of Fauna in the past has been undertaken in a gradually accumulative process, at first simply helping with energetic needs and negotiations, leading eventually to full participation in the conjuration of shamanic black-metal atavism. The continuation of this level of involvement will be decided as further events and intentions progress, both logistically and regarding the space within the spiritual vessel of Fauna. There are no absolutes in a journey of this depth. A two-part question: I’m not sure occult is the right word, but there seems to be an element of magic, mystery, and perhaps even the supernatural to Skagos. Comment, if you would, on what role these things play for you. On a related note – I know that ritual is an important aspect of Fauna’s art, and it would seem to have an enormous influence on what Skagos is and does as well. At least, it would if Skagos were a live entity. Are there any plans for Skagos to play live in the future? To answer the first part of your question, these things permeate our work as they enter and are absorbed within our lives. I, myself, live in a world very different than the world of status quo North Americans. To simply view the trees and plants, mountains and oceans, skies and caves, stars and moon of this earth as sentient beings is alarmingly radical fringe thinking to the greater population’s “normal experience.” To go beyond this, to welcome and recognize the forces, creatures and spirits, those seen and unseen, which intermingle with our immediately experiential plain of existence is then lunacy. Perhaps the most grievous wound to our psyche, the most crippling stagnation, is our devotion to a hyper-rationalistic world-view. I will say, in closing, that in the few truly wild places remaining in this world, our civilized perspectives would be considered an atrophy on the brink of spiritual death. As for the latter half of this answer, there are plans for Skagos to perform in the future. Isaac is currently finding his time almost completely occupied by his participation in the band Half Moon Run, however we do look forward to a time when space is cleared for the actualization of our live intent. And, of course, if this were to transpire (or rather, when it transpires) ritual transcendence will doubtless be a part of the integral whole, whether it is in the passion of heart of the transformation of space. I’ve been fortunate enough to hear the early Skagos demos, and considering where you were then, and where you are now, it seems there has been a tremendous maturation in the songwriting and the music itself. Do you think that an accurate perception, and if so, to what do you owe that? Yes, it is definitely an accurate perception. I can’t remember how old we were when we originally recorded those demos, perhaps sixteen-years-old, maybe freshly seventeen. There has been a substantial amount of maturation between the initial inception and our current workings, and I suppose that is owed most substantially to the linear development of ourselves as people and musicians. When we recorded the demos, we were entirely unsure as to what Skagos was to be, or even what we wanted it to be. We originally wrote an entire full-length demo to be recorded with a tremendous amount of cultivation and control, and after recording a single song we decided to channel an attempt of complete improvisation. Isaac picked up his guitar, I hit record, and the 20-minute piece entitled “seasons” was midwived in to being. Shortly thereafter we realized that our truest potential existed in opening ourselves to the universe at large, to be mouths and tongues through which it speaks a language of tonality, crashes and wails. We have henceforth been largely focusing on our own skill and precision in receiving, comprehending and translating these guided-impulses most purely to the sonic pallet. We often find ourselves looking back at our former work, musically and lyrically, and find ourselves saying things in depths we previously did not even consider, like the intuitive wisdom of children. Of course, an amount of credit must be recognized to the unforeseeable procession of the cosmos in which we were honed, broken and sculpted to be the perfect voices for all that we say. We are loosely guided by the hands behind the veil, and by opening to these intentions, we find ourselves inexplicable in the present. Black metal has become increasingly experimental in recent times – sometimes it’s very good, and sometimes it’s just forced and contrived, and not really experimental at all. Do you find yourselves wanting to experiment with the established sound of black metal? Certainly- in fact, I’m not sure we ever had any intention otherwise. I personally find the purism within black metal to be quite perplexing… black metal itself is a subgenre, an extension beyond pre-existing styles of heavy metal. For any person to claim that it is something particular, that it was always supposed to be that way, and that anything that does not fit to that archetype is false, and thusly not black metal, is purely ridiculous. It is a sort of metaphysical gymnastics to behold someone try and find a common “purity” within the pioneers of the genre and somehow say that bands like Burzum, Ulver, Immortal, Von, Blasphemy and Enslaved were all spearheading one common idiom, and that is all that is black metal. It is even more absurd to watch different antagonist pick and choose what speaks most clearly to themselves (their egos), label that black metal, and try to cast off the rest as chaff. There is a part of me that empathizes with those who have intent to hold allegiance to a well-honed tradition, to fuel and maintain the integrity of it and to defend against outside forces that wish to sully its precision. This is something that seems to be largely integral to many, many human cultures and subcultures. I am not exempt. However, I don’t believe that black metal as a whole is something that can fit in to this rigorous methodology. The current era of modernity and industrialism that we currently find ourselves living in the midst of now is not one that fiercely defends tradition as human cultures once did, unless it is to protect the state. We live in an age of increasing monocultural complexity, and something like black meal does not escape it. It spirals ever outward in a mad frenzy of creative impulse, leaving no stone unturned. To hear people say that early Darkthrone is black metal but later Darkthrone is not is absurd. For people to say that Conqueror is black metal and Fell Voices is not is ridiculous. Even a band such as Liturgy clearly draws most succinctly from the pre-existing notions of black metal and indeed calls themselves black metal, must of course be a divergence on the periphery of, but not all-together escaping the relativity of black metal. To deny as such is to bury one’s head in the sand. Whether you like it or not, all aforementioned bands clearly find their inception in black metal; nulla cur. For a broader understanding of what I am trying to emphasize above, I suggest reading Scott Schroder’s “The Emerging Face of God” on his blog, Spring Speaks Truth. Tell me what these two terms mean to you: Cascadia, and Cascadian Black Metal. It is reassuring to be given space to speak of what these terms mean to me, opposed to discussing their relationship with the world at large. First and foremost, Cascadia represents, to me, a bioregion- economics, nationalism, homogenized cultural-identity and left-wing coups scarcely enter the periphery of my definitive Weltanschauung regarding the term, and I mention them now, only briefly, to affirm my distance from any such allegiance. To affirm one’s self as an occupant of Cascadia is to affirm Diaspora; to know one’s being in the likeness of a seed borne on the wind. As Perlman put it, “’Central Africa,’ ‘Australian,’ ‘America’ are not the names of places where free human beings ever lived. They are the names of unprecedented holocausts, of gigantic colonies, of monstrous Leviathanic trophies. They are the Leviathan’s ‘empty continents.’” To affirm Cascadia is to affirm solace in ambiguity; to live in reverence and boundless love for the land that has held you since birth, while knowing that you are sprouted from the taproot of genocide; to live in constant awareness of the interconnectivity and measureless relativity of all life, human and non-human, while recognizing that your home is not quite your home; to be horrifyingly present with shedding of Leviathanic armour, and the agonizing rebirth of the inner Wilderness. Cascadian Black Metal is thusly an affirmation of Leviathan’s paradoxical disintegration. Black Metal itself can be argued to have emerged as a cultural rejection and resistance to the status quo, as it took form in Nordic and European countries. The ideological, aesthetic and musical conceptions were always birthed of a deeply forlorn and wanton knowledge that things were not always as they are, and the shattering horror that we may never again know what has been lost to us, howling in cacophony the death-throws of the human animal. “The screaming of the captive is the voice of God.” Norse Black Metal can be characterized as anti-Christian, anti-Roman, anti-Abrahamism, probing the depths of longing for the atrophied roots of their dwindling past, recognized only through a superficial veneer. As this movement moved to America, it was often characterized by and presented as formless despair, the completely misanthropic disdain for human life, or the formulated rejection of anything but nondescript sorrow, as distilled most succinctly in the DSBM and USBM scene (of course this is not an all-encompassing observation, merely a relative example.) This nondescript despair is the blind certainty that one’s soul is lost, while never knowing so; never knowing what is lost, only knowing the aching hole it has left. Henceforth, Cascadian Black Metal has been a vaulting point from the stepping-stones laid by our dispossessed contemporaries, to probe the harrowing depths of Diaspora, and to perhaps finally stumble upon the flickering candle of life in the infinite voids and chasms of modernity- a somnambulant stupor over the smoldering coals of atavism. I don’t know how many of your listeners pick up on this, but as I’ve read Against His-story, Against Leviathan about 40 times, I’m very familiar with the anarcho-primitivist author Fredy Perlman, and notice that he’s played a big part in your song titles and lyrics for quite some time. Perlman and his work have made a huge impact on my life, personally - can you tell us how he came to influence your thought and your music and songwriting so significantly? I’m pleased to hear that the obsession is shared. Perlman’s works and perspectives have changed my life in such profound ways, and continue to with every day that passes. To be completely honest, I first encountered word of his existence through the Leech demo, “Against Leviathan!” I looked in to the title, and began to research both the essay, as well as Perlman, himself. It was soon after that I happened across a copy of Against His-Story, Against Leviathan! in Victoria’s infoshop, Camas. I began to read the book that same day, and though it was difficult for me to fully grasp the vastness of the narrative and depths of the concepts at the time, I was nonetheless inspired and floored by the analysis of civilization found within. To this day, I continue to reread the work every so often with my head brimming with new ideas and fresh perspectives on the world around me, looking to challenge him with these ideas, and find that Perlman has already touched base on them in some way. It was only natural for a work of this kind to influence Skagos so heavily, as the exploration that we seek to undertake within the project follows so closely with the intent of Against Leviathan. I truly find it difficult to speak of the topics that I do through lyricism and song titling without using the terminology found within that book, as it has encapsulated my world-view to such an extent that I feel hindered trying to avoid them; for example, referencing the binary concepts of mythic-power-dynamics and modern dichotomies of consumption and creation, falseness and truth, without the aid of Ahriman and Ahura Mazda; or to encapsulate the untouchable immensity of the current human condition without using the metaphor of Leviathan. It has permeated every depth of our lyricism. The Earth is changing in unprecedented ways – some would even contend that the Earth is dying, being killed by man and by civilization. Recent evidence even suggests that we have passed the point of no return, and that collapse is imminent. What role does ideology play for Skagos? Is there a message, or is it a purely personal endeavor? At an earlier time I would have had a very different answer for this question, but my perspectives are undergoing radical changes of late, especially regarding this vein of thought. There was a time when ideology was paramount to Skagos’ role, however I would be more inclined to say, now, that ideology is a set of personally stagnating bias, developed as a way of marginalizing and disconnecting with one’s openness of experience in the world. The only precise answer I can offer in this time of transition is thus: I do not know. And perhaps this is perfect answer for the second part to your question, in short. What I mean is that Skagos has unfolded to be an aural documentation of our journey as people to reclaim the integrity and beauty of our souls, in these times of, as you put it, unprecedented change. If there are any messages to be gleaned from our music, it is the ideas and emotions that can be offered to our listeners, intentional or otherwise. We seek to explore and reclaim our mythic being, and welcome all who find us unto the fold. “Anamnesis II – A Dry, Sterile Thunder, Without Rain”, from the Panopticon split, contains lines from TS Eliot. Besides Eliot and Fredy Perlman, what artists past and present – writers, musicians, visual artists, etc. – do you find inspirational, and which, if any, do you find influencing your music and your lives? To answer for our lives would be a different question all together, so I will answer purely from the standpoint of Skagos. Of course, so many of the artists that pass in out of our perspective influence our daily lives, but of late I am finding the project most inspired by writers such as Scott Schroder, Paul Sheppard, Reginald A. Ray and Ursula Leguin. The influence of musicians would be an extensive list, but I can suggest Fauna, Sacrificial Totem, and the inner circle of Oneiria, as well as Locrian and Merkstave. From a slightly different direction, the offerings of Bob Dylan and Godspeed You! Black Emperor have been enormously influential. However, despite this all, I feel that we are most inspired by the living, breathing, enthralling world around us, waking and unwaking, all plains and dimensions. Hatred has always been a staple of black metal, but what does love mean to your music? I’m not sure how best to address a topic this encompassing. Perhaps that, in and of itself, is the answer. I can say that my view of hatred is seen as a complete lack of trust and openness to the universe around one’s self. Love, on the other hand, is the complete faith in all that confronts our experience; even so far as recognizing those things that we loathe, to be universal providence acting unto our becoming as true human beings. Ást dealt largely with this topic, the title itself being an Old Norse word for deepest intuitive Love. You’ve said that you’ll be self-releasing all future Skagos material. How important is the DIY attitude and practice to Skagos? What format do you predict your releases will see? Yes, this is our intention. I don’t believe that it is a particular commitment to anything that can be labeled as a “DIY attitude” that fuels this decision, but rather the desire for a more intimate relationship with the entity of Skagos as a whole that propels us forward. We desire to be personally linked to the production, presentation and distribution of the work borne of our souls. We have nothing but appreciation and love for the individuals and organizations we have worked with in the past, however it is time for us to take these fateful steps elseward. We may yet still work with certain labels or initiatives in the future, however these endeavors will be exceptions to the norm in the spirit of collaboration, rather than fiscal inability. What does it mean to you for Skagos to be “successful?” In other words, since record sales are not the driving force behind Skagos, at what point do you consider this a successful band? thanks for this!! exactly what i was searching for.